Demonstration by Simon Hope. Tea & Coffee provided during morning and afternoon breaks. Either bring your own packed lunch or sample food from local pubs. Entry will be £5 for half day or £10 for the full day. Organised by Tudor Rose Woodturners. Trade stands, inter-club competitions and exhibitions. Daventry is a small market town in the north-west corner of Northamptonshire. It is close to the M1 J18 and the A5. The leisure centre is in Lodge Road. All parking is free in Daventry. On Friday the car parks close to the Leisure Centre will be full of employee vehicles. Visitors to Woodworks At Daventry are directed to a car park at the end of Eastern Way and we provide a free shuttle bus. If visitors prefer to walk it is less than a ten minute leisurely stroll. On Saturday there will be sufficient parking space close to the Leisure Centre. There are parking bays outside the centre for disabled badge holders. There is an on-site cafe serving hot drinks and snacks. Daventry town centre is a two minute walk away with a wide variety of cafes and restaurants. In the main hall our local Women’s Guild will be serving tea, coffee and fantastic cakes. It’s worth coming just for the cake! Club participation in our turning competitions creates a unique show atmosphere. Details of these competitions and our other attractions can be seen below. One to one Training Day. 1 hour sessions with a Turner, max of 2 hours with any one turner. To be repeated on July. 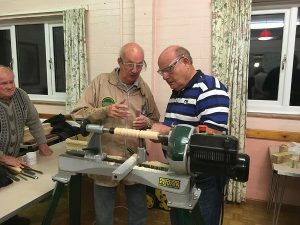 Hands on Night where guests and members can have a go on our club lathes and learn from the more experienced members. Beginners lathe now up and running for newbies who want to have a go at the basics. Ladies and gentlemen all welcome. To be held at The Royal Oak ‘The Splash’, Louth.